It’s Sara from Dinner at the Zoo and today I’m bringing you these amazingly delicious mozzarella stuffed meatballs. Spaghetti and meatballs is one of the few meals that all three of my kids will eat, so it’s on a regular rotation at my house. 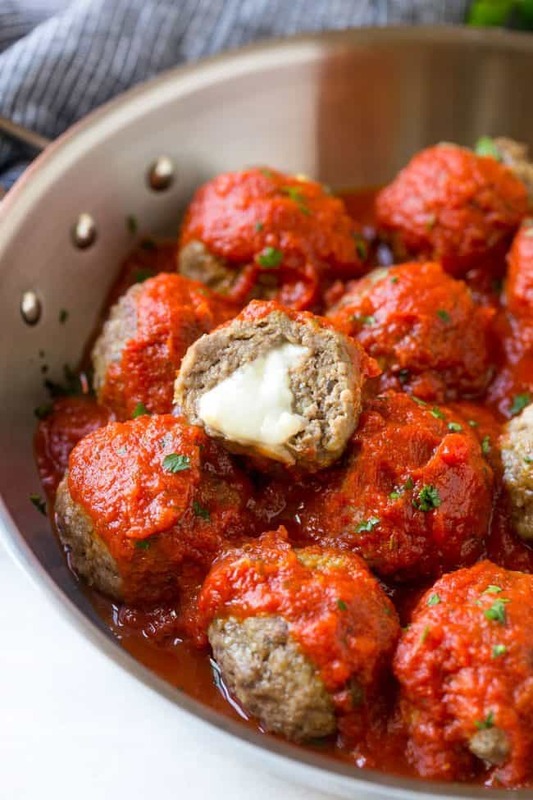 While you certainly can’t go wrong with the classic version of spaghetti and meatballs, you can definitely upgrade the original, which I’ve done here by stuffing each meatball with mozzarella cheese. It’s an unexpected surprise to bite into a meatball and find the cheesy filling! I make these meatballs with lean ground beef. I typically use the 90% lean ground beef, although ground turkey would also work well. The meat is combined with breadcrumbs, egg and seasonings and then wrapped around cubes of mozzarella cheese. I prefer to make these meatballs on the larger size, about 2 inches in diameter. If you’d like to go smaller on the meatballs, simply cut your cheese into smaller cubes and take a few minutes off the cook time. I like to broil my meatballs; it uses way less oil than cooking meatballs in a pan and you can cook large batches at a time. I often make a double batch of these meatballs and freeze half the cooked meatballs for a later date. I typically use a high quality jarred marinara sauce on top of my meatballs, but you could definitely make your own sauce if you prefer. 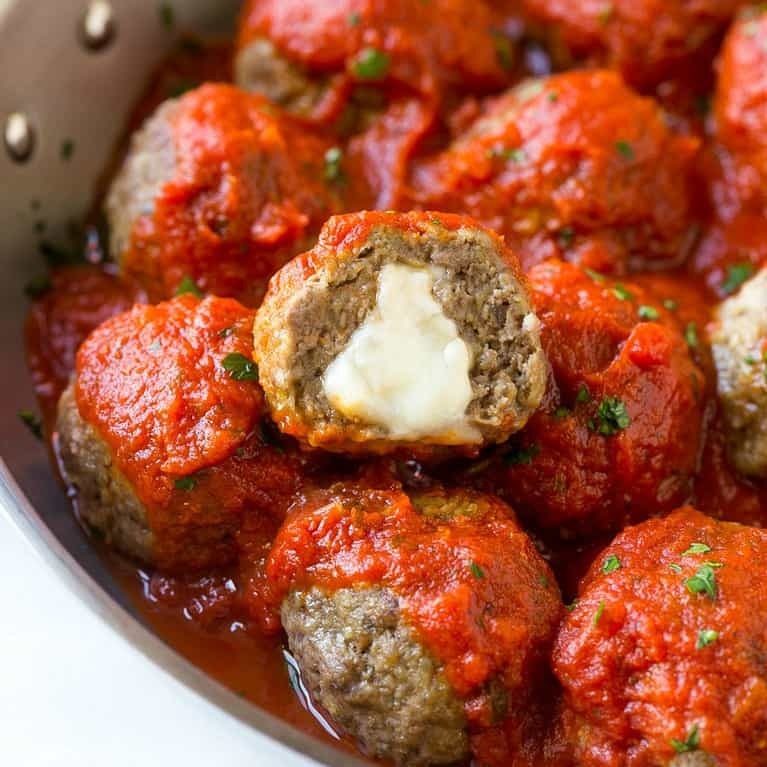 You can serve these meatballs as an appetizer, with spaghetti, or as a pizza topping, and they also make an amazing meatball sub sandwich. 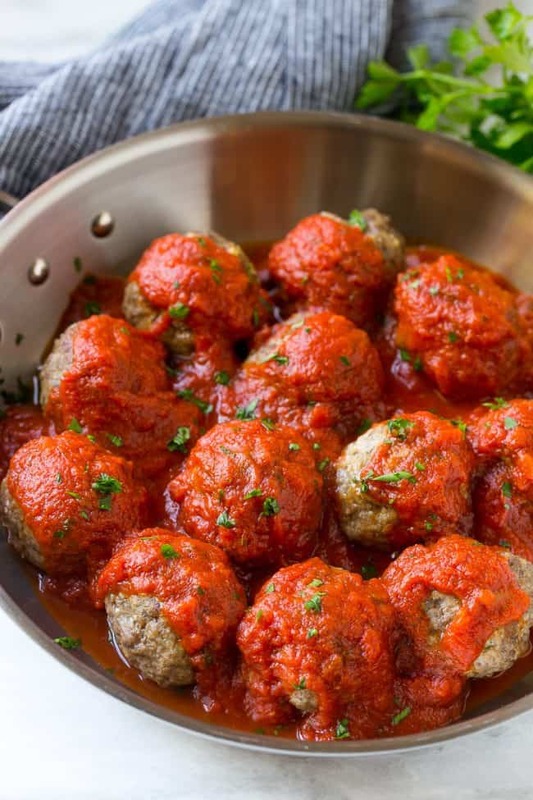 No matter how you serve them, these meatballs are sure to be a hit! These mozzarella stuffed meatballs are a fun twist on the classic recipe - serve these meatballs as a party appetizer or over a big plate of spaghetti for a hearty meal! Spray the tops of the meatballs with cooking spray. Broil for 10 minutes or until meatballs are just done - do not overcook or the cheese filling may start to spill out. oh yummy! These look amazing! Whice temperature, high or low, should I put the broiler on? I put the broiler on low and put them on the bottom rack of the oven. Rolled them on the other side 10 mins in. Then put them in the crockpot with my fav sauce for 6 hours on low. Turned out amazing. Mozzi sticks work perfectly for this. Just lob off a piece. Looks good. Pinned. These were amazing! Made my own breadcrumbs with saltine crackers, since I didn’t have any on hand. I seem to have trouble keeping the cheese inside the meatball. I enclosed the cheese in the meatball and rolled it around to make a ball but the cheese seeps out when it cooks. I also had trouble with tthe cheese leaking out and I think it was because some of the mozzarella chunks were too big. Will try again with smaller pieces of cheese. Can these be prepped the night before, or will the cheese not be any good being in the center of raw meat for that long? No issues with contamination (cook thoroughly as you would normally). May possibly help “set” the meatball and prevent cheese seeping out. These meatballs are so special! Mozzarella inside meatballs is like a good heart in a good person – it makes her even better! 🙂 Really impressed with how this dish looks so please count me in to make this sometime in the near future! These meatballs were amazing! I used milk instead of water and cooked at 400 for 15 minutes before cooking in the sauce a few minutes. I served these as sandwiches on french bread. Absolutely delicious, will make again. Hi! I want to make these for xmas eve and want to make ahead of time. Would you recommend fridge or freezer? And how would you reheat them without the cheese melting out? Was hoping to heat them in the crockpot…Let me know! Thanks! Everything on this site looks amazing! Thank you for sharing. We are starting out with the meatballs and are working through the recipes on your site. Kids are excited for the meatballs…. me too. If frozen how would you reheat them? Thaw first or reheat from frozen? These were great! I cut the breadcrumbs in half so it would be lower in carbs, and it still turned out great. 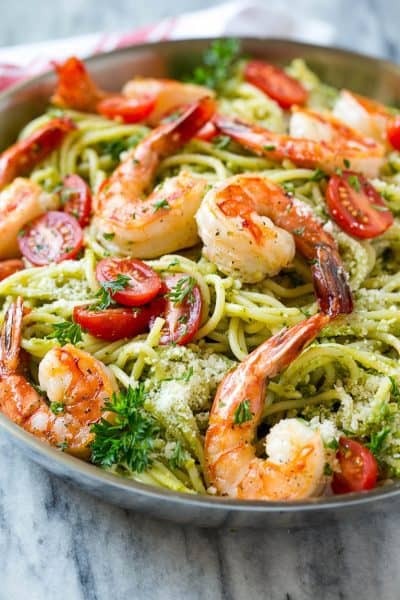 Served this with Victoria’s marinara sauce(lower in carbs then most of the sauces ) over spaghetti squash and it was great and easy to throw together. This has become a go-to recipe for me. I substitute the bread crumbs for almond flour because I am doing keto and they turn out delicious. I made a batch and they last me the whole week for my lunches at work. Thank you. How much Almond Flour did you use? I’m also doing Keto. How many meatballs does this make? Trying to figure out if I need to double the recipe for our group or not. 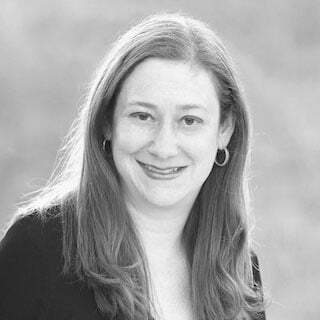 Do you offer Cookbooks? If so how can I get one or two! Stop. Please stop. I am getting addicted to your site. Lol. My kids loved these and they were so easy to make. I’ll definitely make them again sometime. I’m getting ready to do the meatballs with mozzarella in the middle. Step #1 is to preheat broiler. I’m using my oven, so what temp. do you recommend? 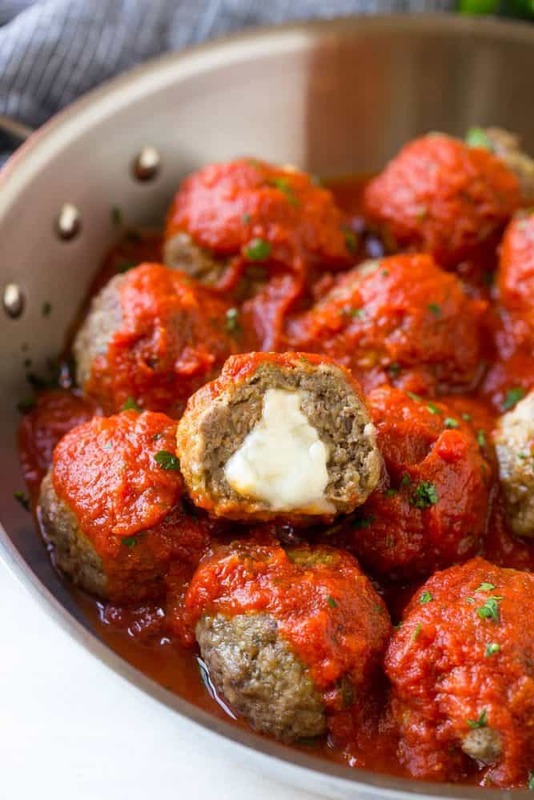 Can these mozzarella stuffed meatballs be baked instead of broiled? Don’t have a broiler! Details please if baked! Thank you! How many mtballs does this make? Made these tonight for my family of 6. EVERYONE loved them!! Used mozzarella string cheese that I sliced – recipe was delicious! My mother went back for seconds. Looking forward to leftovers tomorrow. Gonna try this tonight…so excited! These weren’t as juicy as I thought they would be. Next time I plan on using minced onion and garlic, instead of powdered, and some fresh bread, instead of the bread crumbs to give them a little more fluff. They were still very good though and my kids ate them up! 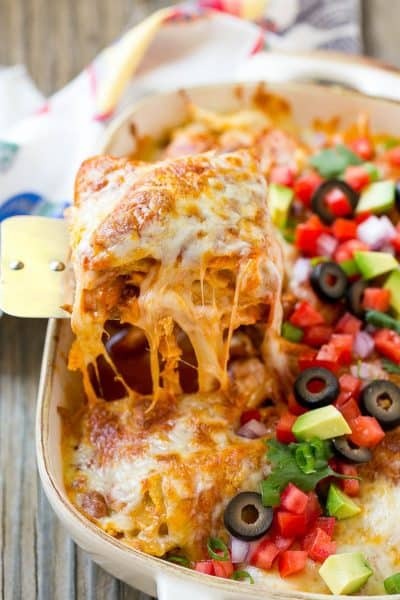 Just attempted to make these and I’m just lost.. idk how they are suppose to cook in 10 min. My temp was still at 130 in 10 minutes broiling in the oven and the cheese burst. So now I’m baking them in the oven at 400 but I’m disappointed because the cheese is all spilt out.. obviously next time will use smaller cheese cubes but can you direct me as to how in the world the cook in 10 minutes broiling and if they are not done yet what I should do? Hoping they taste better than they look.. I am not sure what or why your broiler is set at 130 degrees. It should be increased and the 10 minutes help bake the inside quickly and the outside a little crispiness. The cheese will spill out of a few if there is a little too much in each meatball. It could determine how big your meatball is too. I used a 1 inch scoop.